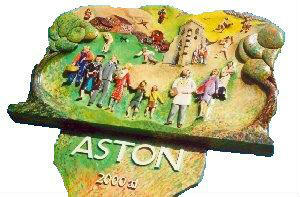 The history of Aston can be traced back almost a thousand years to before the Norman Conquest. At that time the manor of Estone was held by three men under the protection of Stigland, Archbishop of Canterbury. After the conquest it formed part of the lands of Odo, Bishop of Bayeaux. In the Domesday Book it is recorded that 'The Bishop' himself holds Eston, a Priest there and eleven villeins (serfs). There are six cottagers and four bondsmen etc. Odo forfeited in 1088 and Aston remained for some time in the possession of the Crown. Henry I gave it to his wife Adeliza and on the first anniversary of his death in 1136, she gave the manor of Easton to the monks of St. Mary in Reading, for the good of the soul of King Henry. The original of the grant speaks of: 'My manor of Easton with the church and Demesne (manor house and lands) with wood and plain, with meadows and pastures, with waters and mills, with ways and paths'. The abbey continued to hold it, 'by service of praying for the King, his progenitors and successors' until the Dissolution of the Monasteries in 1536. It was in 1505 that the dedication to Our Lady was recorded. 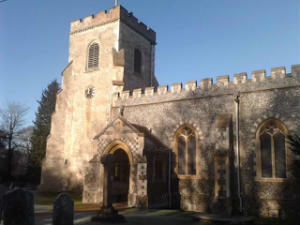 Prior to this, in 1430 and 1490 Aston Church was referred to as "St. James". St. Mary's Church stands on high ground to the West of the village. The church is built of flint with stone dressings on the nave and chancel and the roofs are covered with copper. This copper was used in replacement of the former lead roof which was twice stripped by thieves in the space of two years. The original roof was thatched and the ridge marks of this roof can still be seen on the East side of the tower. The Chancel is the oldest part of the church and was built around 1230. The chancel and nave probably represent the whole of the original church. It was not until the beginning of the 15th century that the West tower was added.